Growing up, my mom made really yummy calzones. They’re not what you’d typically think of as calzones you can get at a pizza shop which would typically be filled with meat, cheese, and tomato sauce. She made them with fresh veggies and pesto. These calzones aren’t going to win any beauty contests, but they are so delicious it doesn’t matter! The original recipe isn’t vegan, so I decided to try veganizing it since I was missing these old favorites. The result was pretty close to the original and just as yummy. I’m glad to have this recipe back in rotation! If you’re making your own pizza dough, you’ll want to start it ahead of time so it has time to rise. I decided to use 2 Trader Joe’s pizza doughs because I didn’t have time to make my own dough over the weekend. Homemade dough is always yummiest however! You might want to make two batches of dough depending on how big the batch is. Make the same amount of dough as you would for 2 pizzas. Make up a batch of The Post Punk Kitchen’s Vegan Pesto. The batch I made ended up yielding about 1 cup of pesto, which was the right amount for the calzone recipe. You can also use your own favorite pesto recipe. Chop the onion and pepper. Saute them in a little oil. Chop the yellow squash, zucchini, and broccoli into small pieces (about 1/2 inch or so). In a small bowl, whisk up the egg replacer powder and warm water. If you don’t have egg replacer on hand, I don’t think it’s a critical part of this recipe. It helps bind the filling together a little, but so does the flour, so if you can’t find Ener-G, don’t worry about it. In a large mixing bowl combine the pesto, onion, pepper, yellow squash or zucchini, broccoli, Daiya, flour, olive oil, egg replacer, and soy milk. Add salt and pepper to taste. Prepare a couple baking pans by drizzling a little olive oil on the pan and sprinkling a light coating of cornmeal on top of the olive oil. Pull off a piece of pizza dough – about 1/3 of a cup, but it doesn’t have to be precise. Stretch it out into a circle like you would a pizza crust. Add some filling to the center of the dough, being careful not to overfill it. Fold the dough in half over the filling and seal down the edges with your fingers. Poke a few little holes in the top of the calzone to vent steam. You can brush a little soy milk on top of the calzone if you like, but it’s optional. Continue making calzones until you’ve used up all of your dough or all of your filling. Bake the calzones for 30-35 minutes until the filling in bubbly and the crust is golden brown. Let them cool for a few minutes and enjoy! I haven’t made baked potatoes in ages. It seems like most of the usual toppings are dairy or meat based, but there are a lot of vegan options as well. 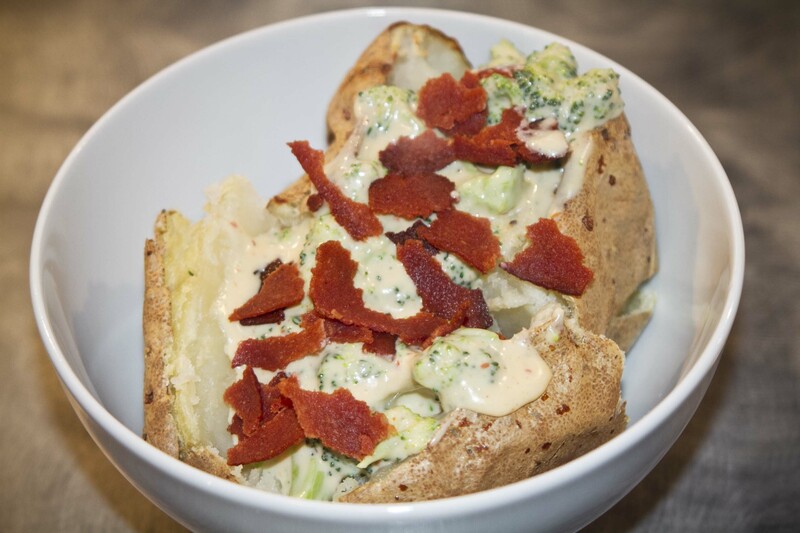 Broccoli and cheddar is a classic flavor combo for baked potato toppings. This is a really yummy and simple vegan version of that classic. Besides baking the potatoes for an hour, this recipe does not take long to make and requires very little prep time. Preheat your oven to 375°. Wash and scrub the potatoes. Poke holes in the potatoes with a fork, so the steam is released as it bakes. You can wrap the potato in aluminum foil, or place it directly in the oven. The potatoes will need to cook for about an hour. You can check them with a fork and pull them out when the middle feels soft enough. While the potato is baking, rinse and chop the broccoli into bite sized florets. Steam them for a couple minutes until just tender. In a sauce pot, combine the soy milk and Daiya cheese over medium heat. Stir until the Daiya melts and combines with the soy milk. Add the salt, garlic powder, and nutritional yeast to the soy milk and Daiya mixture. If you’d like the sauce to be thicker, add a pinch of cornstarch and mix well. Add the broccoli to the sauce and stir. Pan fry the vegan bacon in a little olive oil until the strips are a little crispy. Cut the potatoes almost in half lengthwise, leaving the two halves still attached. Pour the broccoli cheese sauce over the potatoes. Crumble the vegan bacon strips and sprinkle on top. I’ve been on a roasted veggie kick recently. I’m not sure why, but I can’t seem to get enough! I used to make Honey Lime Roasted Veggie Quesadillas with pepperjack cheese before I became vegan. I’ve adapted that recipe by replacing the honey with agave, the pepperjack with Daiya, and regular sour cream with Tofutti Vegan Sour Cream. The vegan version is just as tasty! Feel free to add in your favorite veggies and toppings. Chop the red pepper, onion, zucchini, and yellow squash into small chunks. Thinly slice the shallots and garlic cloves. Place all the chopped veggies and the frozen corn in a roasting pan with sides. Juice the limes and lemon. Add agave and stir with a whisk. Pour the agave juice mixture over the veggies and toss so they are well coated. Roast the veggies for about 30-40 minutes. Once the veggies are done roasting, place a tortilla on a skillet over medium heat. Sprinkle an even layer of Daiya pepperjack cheese on the tortilla. Don’t use too much cheese. Let the Daiya melt on the tortilla, and then place the tortilla on a plate. Toast a second tortilla without cheese. It helps if the tortillas get a little crispy on the skillet because it will make the quesadilla easier to eat (and tastier!). 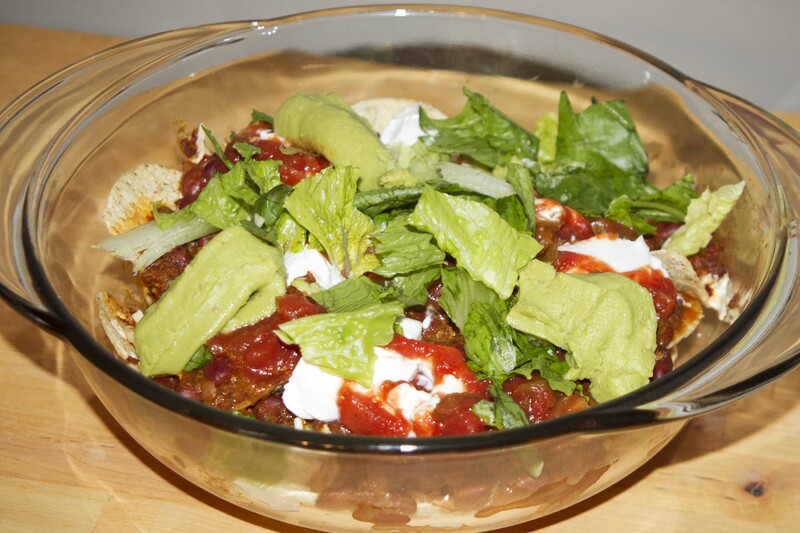 Place a layer of veggies on the first tortilla on top of the Daiya. Sandwich the second toasted tortilla on top. Cut the quesadilla into quarters and top with vegan sour cream and fresh salsa.